Consider this a postcard from the cloud-covered peak of Dream Mountain. Now, don’t be fooled – it’s the first summit in a whole range of goals, aspirations and career dreams. But here I am, playing my ukulele, watching the llamas frolic, eating berries that I picked on the trail and hid away in the kind of beard one grows on long, epic journeys fraught with trials and challenges, pitfalls and moments of derring-do. You must WANT to do this so badly that you will accept no other alternative. You must be determined, you must crave it. You must have an insatiable appetite to be published that rivals a zombie’s craving for brains. Forget the odds. You can read a thousand articles a day about how hard it is to break in or break through, but why? Odds are meant to be beaten. They may not be “ever in your favor,” but why let that stop you? Seize opportunity. Cat Stevens sang “life is like a maze of doors and they all open from the side you’re on.” You will constantly be presented with doors, but you must recognize the opportunities and then open them. Do not hesitate. Do not think they might come again. Do not fool yourself into thinking that someone will open them for you. Take risks. Don’t be afraid to write that thing that might make people whisper about you in the grocery store. Tell the story you want to tell. Don’t be afraid to query that agent, or submit that story. Don’t be afraid to write in a new style or genre. Don’t be afraid to fail. Sacrifice. Learn how to say “no.” Guard your time. Stop watching TV. Get up earlier. No more video games. Give up your position as the treasurer for the community pudding club. Stop watching baby goat videos on YouTube (it’s difficult, I know) and stop playing around on Facebook. Be resilient. Rejection is a big part of this game. It hurts, yes. Every rejection is like a paper cut on our soul. Don’t keep poking your finger in the wound, slap a bandage on it and be tough. You have to be tough, or else you will eventually crumble. Keep moving forward. I have this quote tattooed on my arm and part of it reads: “Yesterday is history…tomorrow is a mystery…” Got rejected? Bad review? No answers to the first 92 queries you sent out? It’s easy to wallow in despair. Don’t. Be sad, or mad, or aggravated, but move forward, like a shark…always swimming forward. Believe. Believe in yourself. Believe in your dreams. You may be fortunate enough to have some people around you who truly believe in you too, but there will be many people who will see your dreams as just that…wishful hopes and dreams. Believe you can prove them wrong. Enjoy it. As grueling and exhausting and painstaking as the process is, it is also absolutely beautiful. Each stage has its own nuances to love, so many firsts. Enjoy every step of the journey, every climbing spike you hammer into the mountain, every single handhold from which you dangle, and have dangled, over the valley from which you began on your journey. These things I have yodeled are not new, they are not words of magic carrying promises or absolutes. They are merely words of encouragement, a bit of insight, a dash of experience, from someone who is, and has been, on the same journey as you, my fellow writers. Sure, I’m enjoying the view from this peak, celebrating the release of my new book. But the journey has just begun. There are more stories to write and much more work to be done. Time to shoulder my pack, gather my strength and continue on towards the next mountain. I’ll see you on the trail and listen for your yodel. 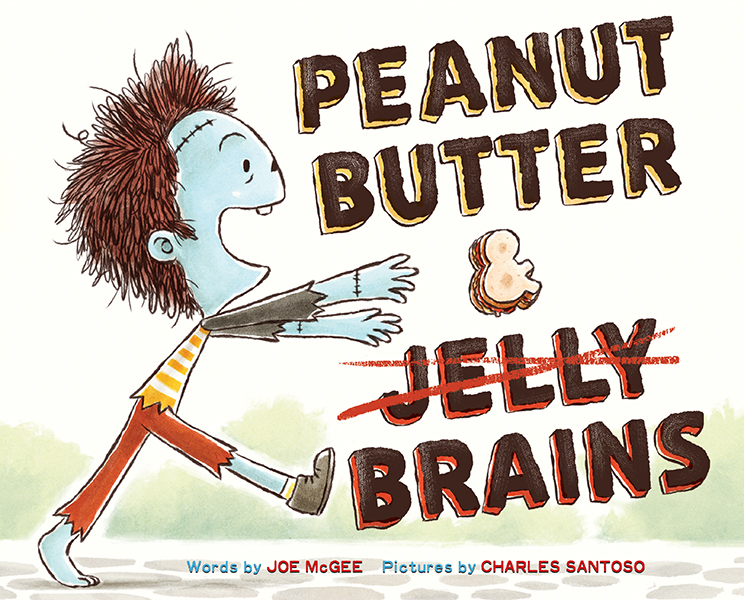 I’d like to give away a copy of PEANUT BUTTER & BRAINS to one lucky reader. Here’s what you need to do: Since PB&B is all about being true to yourself, tell me something in the comments below that makes you unique, something you are really proud of, something that defines you, or a moment when you followed your heart. I want to celebrate your individuality with you. I want to hear your stories. I’ll randomly draw a winner from all of the people who comment by Tuesday, August 11th at 9pm EST. Thanks Joe for the blog! It is exactly what the doctor ordered for me. UNFORTUNATLEY poor me was in Cancun and I postponed my entry for the giveaway until it was too late. Oh, well. But your words where very inspirational and fun to read. I am rather late in the game of writing (59 years old). No beard (Well, that’s good since I am female) and no wisdom. But someday I will play on the mountain top with all the other book goats and yodel away. I admire you for writing while raising three boys. I raised three boys as well. We all survived and they even turned out. By the way ‘leiderhosen’ is actually spelled Lederhosen. Leder=leather, Hosen=pants. Leider= unfortunately or suffering. Well, maybe that’s exactly what you meant! 😉 Happy Writings and wish you the best of luck! Thank you so much for reading and I’m glad you found my words worth reading. Good catch on the LEDERHOSEN! Best of luck to you! Yeah, I’ve been a bit busy, lol….and yes, it’s tough to give up those things that seem like harmless little bits of entertainment until you realize what time parasites they are. Priorities become just that…priority. Nice to hear from you, Patti! I love this! Congrats on making a dream come true. The title is fantastic and I’m betting the story is as well. Great and insightful tips! It’s funny how you go from breaking one routine (of Facebook and baby goat videos) to a new routine (of determination, constant writing and accepting rejection). It’s easy to fall back into what’s safe, but isn’t part of the writing process to make you tap into something new and different? Absolutely, Mary. I think that’s part of the hard work and risk-taking, trying new things, stretching your comfort zone and finding new ways to approach the craft. Besides, writing is an excellent way to not only learn more about ourselves, but to help make sense of the world. Wonderful post, and congratulations on Brains! Looks awesome! After four summers of writing (I’m a teacher), I finally finished my first novel, which was good for a yodel, as well. Can’t wait to share your book with my daughter. Thanks, Jared and a HUGE congrats on finishing your novel! That’s a major yodel, right there. Let me know what your daughter thinks of PB&B! I have one question for you….Who is your favorite Doctor? I love David Tennant (because…who doesn’t?) but I would have to say that my favorite is the 9th Doctor. I should mention, though, that while I’ve been watching Star Trek since the 60s, I’m a new comer to the whole Doctor Who universe (I started with the Russell T Davies reboot) and find it hard to get into the cheesier old shows. That’s awesome, Teresa and you may be the first person I’ve asked who said that the 9th is their favorite! Wow, that’s cool! I have a son-in-law who loves zombies. Thus I have a granddaughter who loves zombies. Guess which new picture book I’ll be packing next time I visit? Me, I love watching my grandchildren read! Congratulations on your debut PB! How exciting for you! I’m definitely going to check this one out. I hiked over 600 miles through the Himalayas 3 years ago, with 2 treasured jars of PB. Wish I had had that jelly to go with! Best wishes for huge success on your PB! Wow! My head is spinning…600 miles through the Himalayas? Treasured jars of peanut butter? Were you carrying the jars to safety? Were they the Dalai Lama’s blessed peanut butter jars? Were they sacred? Were they political refugees? Creamy or crunchy? Did you see a yeti? Did you share the peanut butter WITH the yeti? So. many. stories…. Walking into an office supply or an art store gives me quivers of excitement. Can’t tell you how many pencil cases, pens, paints, and notebooks I have! Love Peanut Butter & Brains…te-he! I love “art store” and “quivers of excitement” in the same sentence. Hey, these places offer tools for creativity, excited quivering is absolutely encouraged! LOVE the title of your book and your yodels! Thanks for sharing!! Thank you for this post. I loved reading it. Your book looks fun. Something about me, is that I love chocolate covered strawberries. I make them everyday. And tell myself they are healthy. You are very welcome, Ashley. And wow…chocolate covered strawberries EVERY day!? I want to be your neighbor. Congrats on on the picture book! (Great title too.) Something I am proud of is the decision to take my picture book from desktop to Southampton Writing Conference this summer. I am no longer scared to try. Awesome, Maureen! Fear holds us back from so many things. Once we can push past that, life is ours to seize. Glad to hear this! This was such a great reminder! Thank you! I look forward to reading your new book and speaking about it at the grocery store. Wishing you tons of success! Each moment spent in creative expression is a moment of following my heart. It may be typing a few pages of a manuscript. Maybe just a snippet of dialogue added to my writing journal. Or it could be sitting at the piano and stringing some chords together in a new way. The heart-following creativity may not (okay . . . DOESN’T) pay the bills. But it sure helps make each day more fulfilling. Musician Ani DiFranco had this awesome quote, years ago: “Art is why I get up in the morning.” I am right there with you, T.P. There is something about bright, unique shoes that makes me peppy. When I was a kid, and again in college, it was red Keds. Now it’s cupcake Chucks. I wrote a picture book about my happy shoes in college, and that’s when I vowed I would publish my work one day. I’m working on that dream…in my cupcake shoes. 🙂 I can’t wait to read PB & J Brains! Looks great, Joe. Thanks, Carrie! Keep working, cupcake shoes and all! Incidentally, I am a big fan of Chucks, always have been. I followed my heart when all the odds were stacked against me and managed to get Disney to make a movie of my book! And even though–let’s put it delicately–I’m eligible for Medicare (and then some), I still continue to tell stories. I loved reading this & your book sounds amazing! I’m looking forward to reading it! A moment I followed my heart – when I registered for my first SCBWI conference last February in NY. If I hadn’t attended I don’t think I would have been able to write the story that got me my agent and that’s now on submission. These are such encouraging and enthusiastic words about the journey to publication! You can feel Joe’s excitement jump through the screen. Thanks for the re-charge! You are welcome, and thank YOU for sharing it! Congrats on the book! (Love the title!) Something I’m really proud of is the fact I’m a 3rd degree black belt. I took up taekwondo in my late 30’s and so it’s often really challenging physically to continue. (I train with people young enough to be my kids.) But any time I feel slow or old I remind myself, at least I’m out here on the mats trying! Thank you, and good for you, pushing those challenges AND having such a great attitude about it! Congratulations on your debut picture book. Keep climbing those mountains!! Something unique about me…hmmm…I love flat land. Most people seem to love rolling hills and valleys and mountains. I love a good, flat field (Indiana’s till plains) that stretch as far as the eye can see! Thanks, Katie! I’ve yet to experience this kind of view, where the land is a tabletop, stretching to kiss the horizon. Must be pretty cool! Joe, I can not grow a real beard, but I can metaphorically stroke mine as I cast about for the mountain top.This is such a great post and I am stoked for your debut PB! Congrats. OK, what makes me unique? This is career 2.0 and I was not afraid to start it at the ripe young age of 60. 2.5 years later, I have an agent, I’ve meet gorgeous people on this journey, and I have a NF PB bio out on submission. Fingers crossed for all of us to see the peaks. Oh, an d I ma the worst typist EVER. Thank you so much! You are not alone, I also had to make a career change to get back to what I loved and wanted to do (I made mine just before turning 40; had a few detours along the way). Congrats on your successes so far and my fingers are crossed for your book out on sub! I love paint chips. I had a collection of them as a kid, that I kept under my bed. I can not resist them even as an adult when I go to the hardware store – all those colors. I restrain myself from taking them home with me now, but I still walk by just to say hello to all the colors. The names they give those colors make awesome descriptions. It’s like a color thesaurus, right there in the hardware store! Thanks for sharing!